Liu Xiaodong is a painter of modern life, whose large-scale works serve as a kind of history painting for the emerging world. Liu locates the human dimension to such global issues as population displacement, environmental crisis and economic upheaval, but through carefully orchestrated compositions, he walks the line between artifice and reality. A leading figure among the Chinese Neo-Realist painters to emerge in the 1990s, his adherence to figurative painting amounts to a conceptual stance within a contemporary art context where photographic media dominate. His undertaking ‘to see people as they really are’ was galvanised in the aftermath of 1989 events and, alert to the legacy of Chinese Socialist Realism, his compositions are painted with loose, casual brushstrokes and layered with meaning. While he works from life and often en plein air, he chooses sitters to supply ancillary narratives to landscapes or situations. From recent location-specific series, such as Transgender/Gay in Berlin, featuring portraits of the transgender woman Sasha Maria which were featured in Liu's first comprehensive retrospective 'Slow Homecoming' in Düsseldorf, to his London series Half Street (2013), as well as The Hotan Project (2012-13) in the Xinjiang province of China, Liu has also created an automated painting machine entitled Weight of Insomnia (2016), which translates a digital video feed of traffic streams and human movement in real time into a new body of paintings tracing time, memory and behaviour. 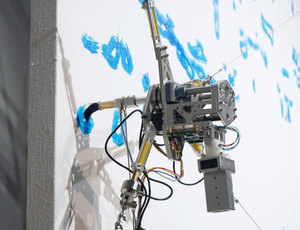 In so doing, Liu re-assesses painting in the age of internet and algorithm and implicitly invokes the present condition, in which humans and other objects reciprocally co-create the world as we know it. 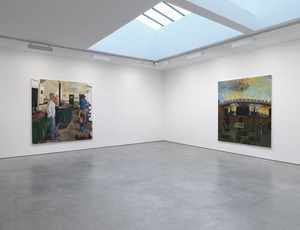 Liu Xiaodong lives and works in Beijing but has undertaken projects in Tibet, Japan, Italy, the UK, Cuba and Austria, and closer to home, in Jincheng, in the north-eastern province of Liaoning, China, where he was born in 1963. He has a BFA and an MFA in painting from the Central Academy of Fine Arts, Beijing (1988, 1995), where he now holds tenure as professor. He continued his studies at the Academy of Fine Arts, University of Complutense, Madrid, Spain (1998–99). His work has been the subject of numerous solo exhibitions at venues including the NRW-Forum & Kunsthalle Düsseldorf, Düsseldorf, Germany (2018); Chronus Art Centre, Shanghai, China (2016); Palazzo Strozzi, Florence, Italy (2016); Fondazione Giorgio Cini, Venice, Italy (2015); Shao Zhong Foundation Art Museum, Guangzhou, China (2014); Minsheng Museum, Shanghai, China (2014); Seattle Art Museum, WA, USA (2013); Today Art Museum, Beijing, China (2013); Kunsthaus Graz, Austria (2012); Xinjiang Arts Centre, Urumqi, China (2012); and Ullens Center for Contemporary Art, Beijing, China (2010). His work has also been included in numerous group exhibitions including Qatar Museums Gallery, Doha (2016), Gwangju Biennale (2014), Shanghai Biennale (2000, 2010), the 15th Biennale of Sydney, Australia (2006) and the Venice Biennale, Italy (2013, 1997). Acrylic on C-print Framed: 58.5 x 47.3 x 5 cm / 23 x 18 1/2 x 2 in. Acrylic on C-print Framed: 47.3 x 58.5 x 5 cm / 18 1/2 x 23 x 2 in. Oil on canvas 250 x 300 cm / 98 1/2 x 118 in. Oil on canvas 20 canvases 60 x 60 cm each / 23 1/2 x 23 1/2 in. Overall dimensions: 240 x 300 cm / 94 1/2 x 118 in. Oil on canvas 90 x 100 cm / 35 1/2 x 39 in. Oil on canvas 300 x 400 cm / 118 x 157 1/2 in. Oil on canvas 33 x 38 cm / 13 x 15 in. Oil on canvas 300 x 1000 cm / 118 x 393 in. Oil on cotton duck 200 x 220 cm / 79 x 86 1/2 in. Oil on canvas Diptych 42.4 x 30 x 2 cm / 16 2/3 x 11 2/3 x 2/3 in. Oil on canvas Diptych Each: 20 x 30 x 2 cm / 8 x 12 x 1 in. Oil on cotton duck 220 x 225 cm / 86 1/2 x 88 1/2 in. Acrylic on canvas 250 x 300 cm 98 3/8 x 118 1/8 in. Group of 4 paintings Oil on canvas 60 x 60 x 3.8 cm, 40 x 40 x 3.8 cm, 30 x 30 x 3.8 cm and 20 x 20 x 3.8cm 23 1/2 x 23 1/2 x 1 1/2, 15 2/3 x 15 2/3 x 1 1/2, 11 2/3 x 11 2/3 x 1 1/2 and 7 2/3 x 7 2/3 x 1 1/2 in. Group of 4 paintings Oil on canvas 60 x 60 x 3.8 cm, 40 x 40 x 3.8 cm, 30 x 30 x 3.8 cm, and 20 x 20 x 3.8cm 23 1/2 x 23 1/2 x 1 1/2, 15 2/3 x 15 2/3 x 1 1/2, 11 2/3 x 11 2/3 x 1 1/2 and 7 2/3 x 7 2/3 x 1 1/2 in.